What: Division 4 Super Bowl. Coaches: Dighton-Rehoboth — Dave Moura (second season, 13-9); Nashoba — Jamie Tucker (sixth season, 54-16). Scoring: Dighton-Rehoboth (29.2 ppg); Nashoba (22.8 ppg). Defense: Dighton-Rehoboth (10.6 ppg); Nashoba (10.8 ppg). The heavies up front: Dighton-Rehoboth — Jake Enos (5-11, 235); Nashoba — Eil Batchell (6-4, 225). Stat check: Nashoba features a balanced attack. Quarterback Sam Bolinsky has 1,673 yards passing, 22 touchdowns, and just four interceptions. Senior back Alex Childs has rushed for 644 yards and nine touchdowns and junior Aidan Lee has contributed 324 yards and six touchdowns. Senior Matt Johnson leads the team with 94 tackles. Junior Jack Bonazzoli and senior John Duros have three interceptions apiece. Dighton-Rehoboth senior quarterback Harrison Pray has passed for 1,027 yards and 12 touchdowns. Senior Reis Foley (712 yards, 7 TDs), senior Chase Carroll (615 yards, 8 TDs), and senior Joe Carrera (464 yards, 10 TDs) lead the Falcons’ ground game. Senior Owen Arden has five interceptions. The captains: Dighton-Rehoboth — OL Mason Cadorette (Sr.), TE Matt Moura (Sr.), LB Dylan Iodice (Sr.), FB/LB Chase Carroll (Sr.); Nashoba — QB/DB Sam Bolinsky (Sr.), TE/LB Matt Johnson (Sr.), RB/LB Brendan Lee (Sr.), C/DL Jack Wood (Sr.). Seniors on the roster: Dighton-Rehoboth — 20; Nashoba — 18. 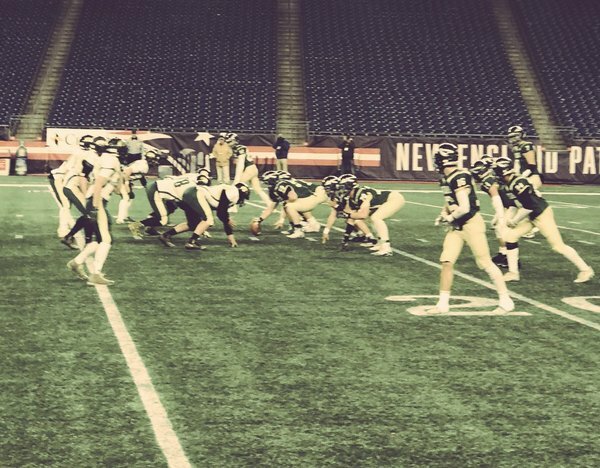 Last Bowl appearance: Dighton-Rehoboth — 1999 Nashoba — 2017. This matchup features two of the top defenses in Division 4. 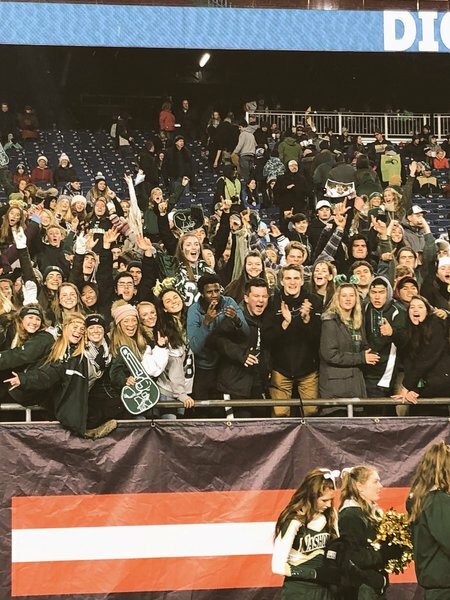 Nashoba is making its second consecutive Super Bowl appearance and third in four seasons. 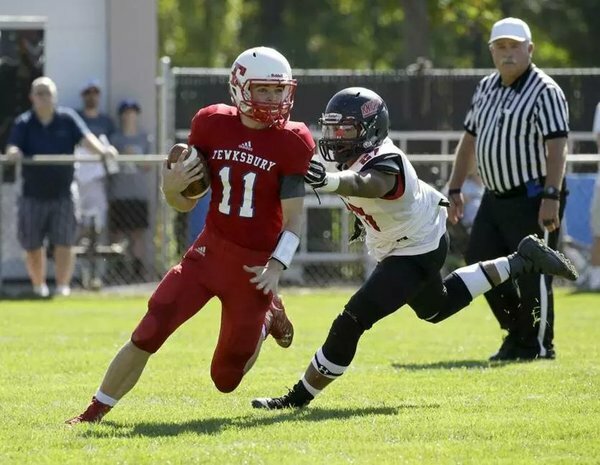 It rattled off six consecutive wins to start the season before a 35-0 loss to Wachusett. Since then, Nashoba has outscored opponents, 117-59, allowing just 9 points per game during the postseason. Dighton-Rehoboth was a surprise out of the South despite earning the top seed, knocking off a loaded Milton team in the sectional finals before holding Gloucester’s potent running team to just 14 points in the state semifinals. This game will be decided by defense. The team that limits big-yardage plays and forces turnovers will come away with the trophy. Dighton-Rehoboth’s defense is stingy but Nashoba has experience on its side. 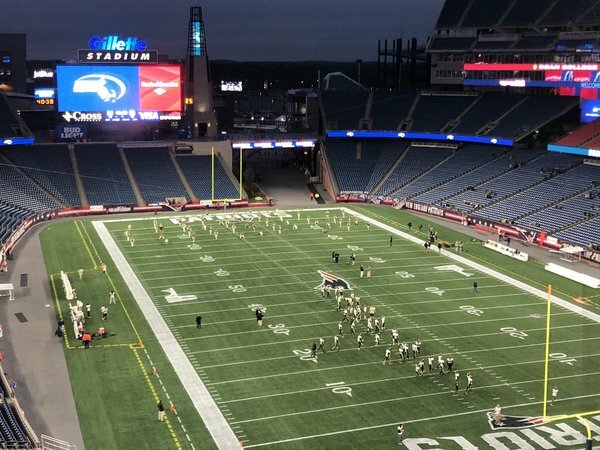 At Gillette Stadium for a 🏈 state championship doubleheader. Coin toss was at the championship breakfast here at Gillette on Tuesday. Nashoba (11-1) won, deferred, and D-R (9-2) will receive going left to right. Brian Ripley returns the opening kick and D-R starts from the 33. D-R gets one first down on its opening drive and punts. Nashoba takes over at own 22. Sam Bolinsky gets Nashoba out of trouble on 3rd and 10 with a 14-yd completion to Troy Barksdale. D-R defensive line doing a nice job getting to the backfield. 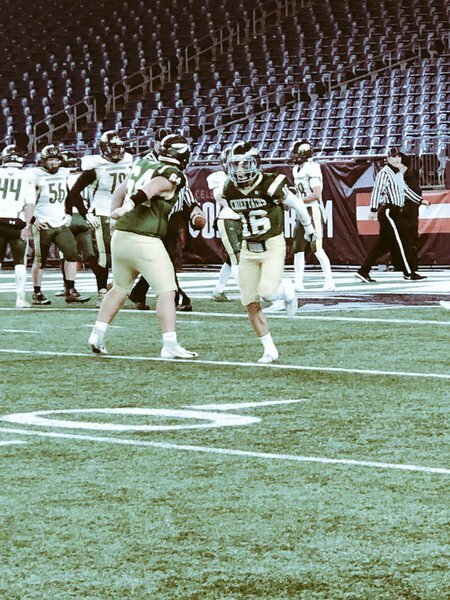 Nashoba QB Sam Bolinsky was 1-5 for 14 yards on his first drive. Hurried often. Nashoba punts. Both Dighton-Rehoboth and Nashoba Regional’s first drives ended in punts. @DRHighSchool takes over on their own 18 yard line. Troy Barksdale comes up with an interception for Nashoba on 4th and 9. Chieftains ball at their own 13. Nashoba Regional comes up with the red zone interception to halt Dighton-Rehoboth’s strong drive. It’s 0-0 with 30 seconds left in the 1st quarter. END 1ST QUARTER: Nashoba 0, Dighton-Rehoboth 0. Nashoba ball 3rd and 2 at its own 22. D-R picked up 71 yards of offense in the first quarter and was 3-of-6 on third down. Matt Moura and Jake Enos sack Bolinsky on 3rd and 5. Nashoba punts. Now there's some offense. Brendan Lee catches a 61-yard pass from Bolinsky. Nashoba first and 10 at the D-R 15. Next play for D-R is a well designed screen to Brendan Lee, who goes 61 yards to the 15. Then Alex Childs goes 15 yards off LT for a TD. Alex Childs rushes it in for a touchdown. He kicks the XP, it's good. 7-0 Nashoba, 4:40 left in the second. Nashoba Regional runs it into the end zone for the first TD of the game. Nashoba leads Dighton-Rehoboth 7-0 with 4:34 left in the first half. Bolinsky and Barksdale connect for a 40-yard pass. Chieftains' ball at the D-R 20. Nashoba Regional QB, Sam Bolinsky, throws a beautiful TD pass to give Nashoba a 14-0 lead in the 2nd half. 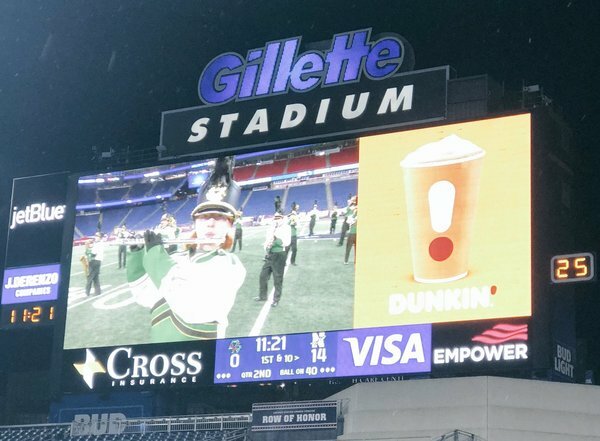 HALF: Nashoba 14, Dighton-Rehoboth 0. Barksdale was a big key for Nashoba in the first half. An interception, he defended a touchdown, and he caught a big 40-yard pass that set up the TD pass to Danby. Second half is underway. D-R takes the kick back to its own 14.